"COUPLES COOKING: Steamin' Hot! -- If you can’t take the heat, come to a different class. Bring your favorite spicy partner and join us. This class is all about steam and spice and makin’ it nice!" 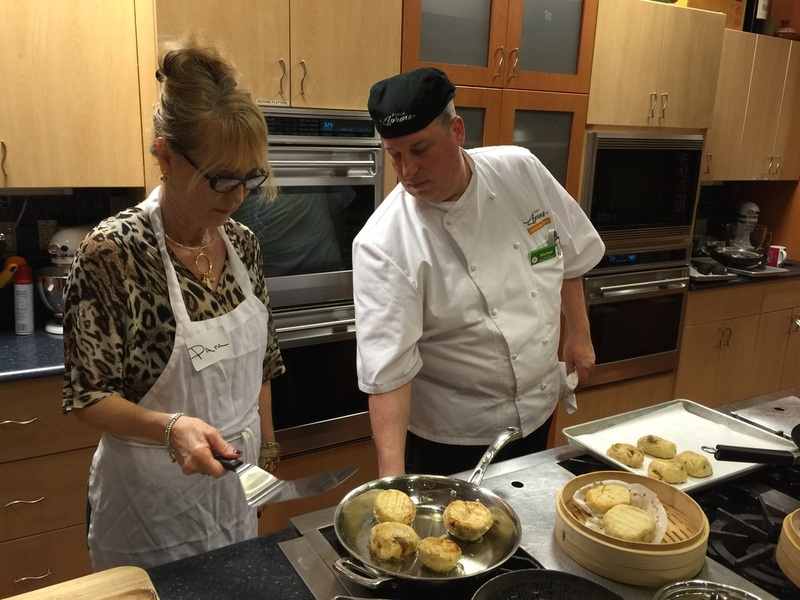 "Spicy" partner in tow, we headed to Boca to, as the brochure for the cooking school states, "Have some fun in the kitchen." Our first misstep happened immediately and we weren't even near the kitchen! We went inside the Publix store at the Polo Club Shoppes, which was bustling with flocks of people buying Easter stuff. However, with a quick glance around we felt we already needed assistance. Customer Service to the rescue. Yeah, the cooking school is next door, completely separate from the grocery store. Signage for the cooking school is clearly visible on the outside. It was us, not them. Once inside, we were warmly greeted by Chef Jeremiah. 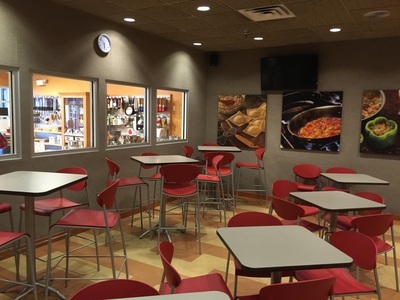 We were early, so he instructed us to go inside the cooking area and make ourselves comfortable. 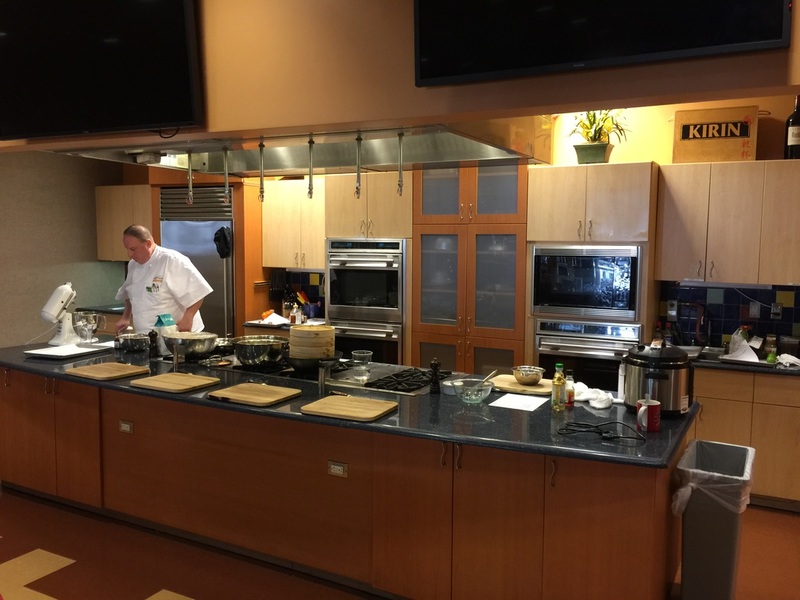 Stepping inside the cooking school facility, we were impressed. The decor, lighting and entire set-up and ambiance was inviting. Chef Michael, who was busy behind the cooking area, gave us a hearty greeting and instructed us toward a table draped with a black tablecloth, information sheets, four white aprons rolled tightly, name tags and pens. We unrolled our aprons and affixed our name tag. Aprons on, we were looking good (our opinion), official and ready to get chopping! 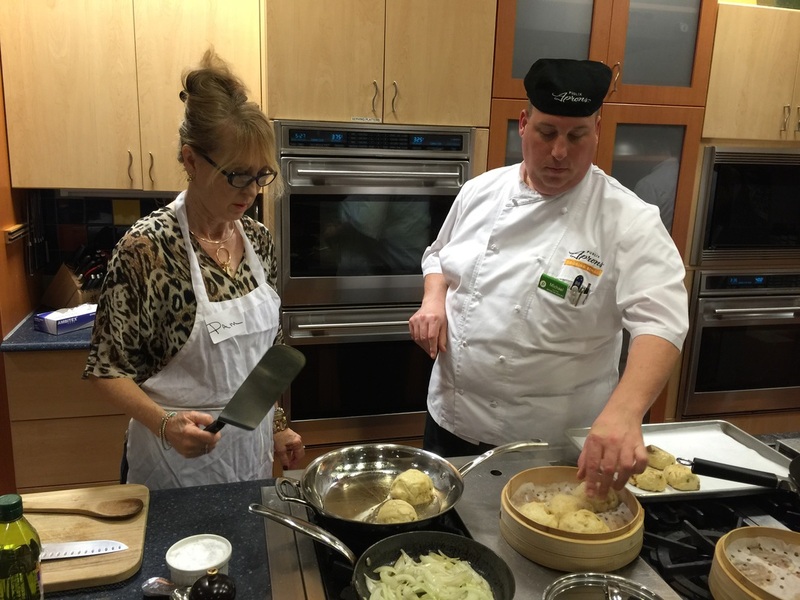 Soon, another couple -- Mike and Sharon -- and Chef Jeremiah joined us, and the class began. This three-hour class was hands-on, as opposed to demonstration only. You must wear closed-in shoes for this class. Tip from Pam: "My mistake? I wore wedge-heels. My advice? Flats." The four of us lined up at wooden cutting boards with large knives resting on the side. Instructions were politely given on the importance of washing hands if you touched your phone, face or anything not food-related. The basin, soap and paper towels are located a few steps away. The menu: "Spiced Pork Shu Mai Buns; Chicken and Scallion Wontons with Garlic Chili Dipping Sauce; Peppered Beef Tamales with Avocado Crema; Spicy Salmon, with Onions and Peppers en Papillote." We were to assist -- and we say assist because believe me, the Chefs did ALL the heavy lifting on ALL the dishes -- which were somewhat involved. Hands-on meant each of us were given the opportunity to pitch-in and give it our best shot. We were encouraged, but not pressured. So, we measured things, chopped things, smashed some garlic, mixed some things...you get the picture. Both chefs were funny, informative, professional and put us at ease. 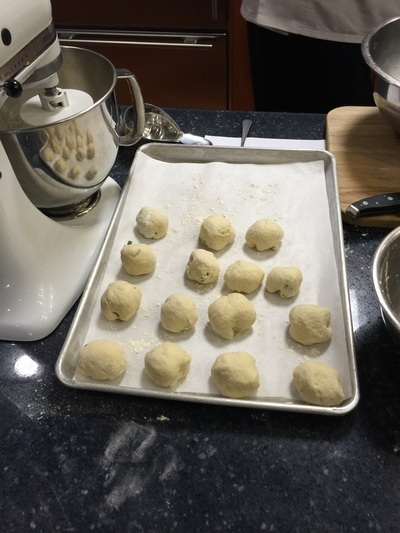 When the first recipe Chef Michael presented involved yeast rising dough, Pam's palms began to sweat: "I do not rise to the occasion of dough working," she admits. "But, his reassurances and easy going manner put me immediately at ease. 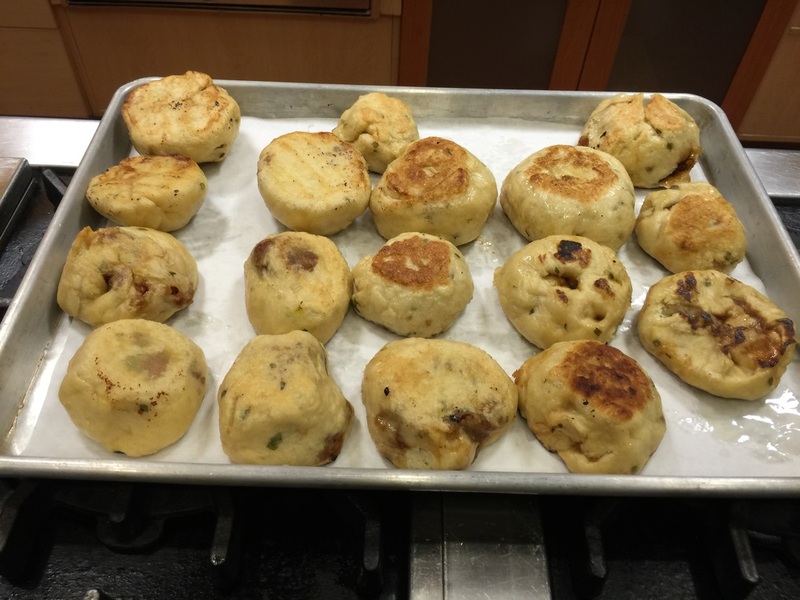 Although he had done all the real work, I felt a small sense of triumph as I pulled and folded chunks of dough into little buns and placed them onto the parchment-lined cooking sheet." 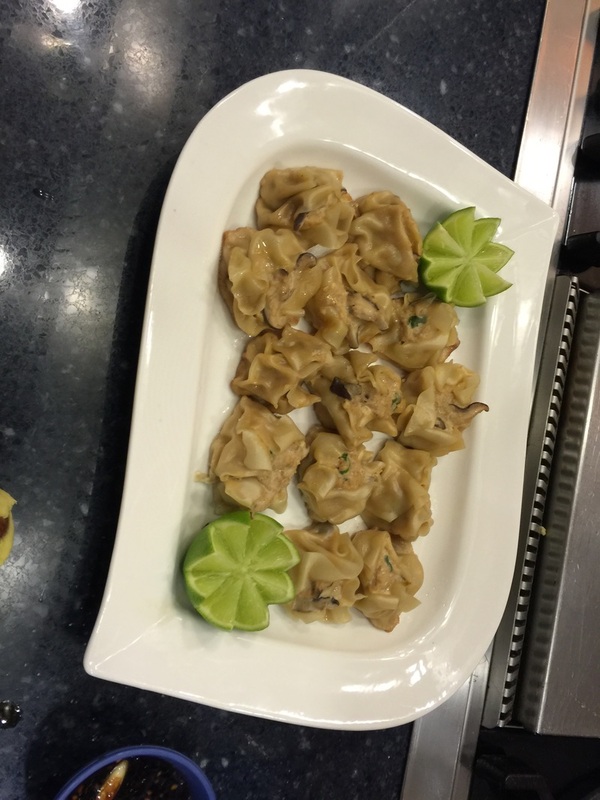 The cooking area is large, modern and the chefs were well prepared and efficient as they worked and instructed us. The food was fresh and it was all completely inviting. 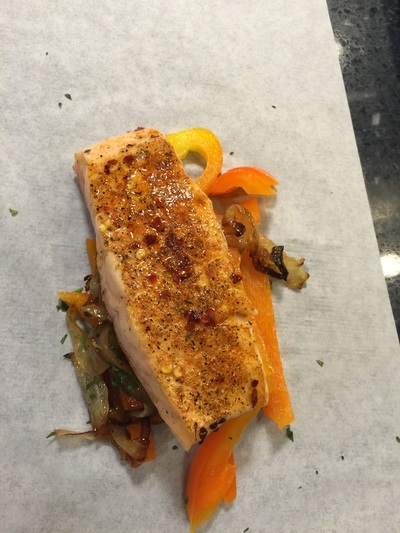 Cooking fish in parchment paper is the only way to do it. 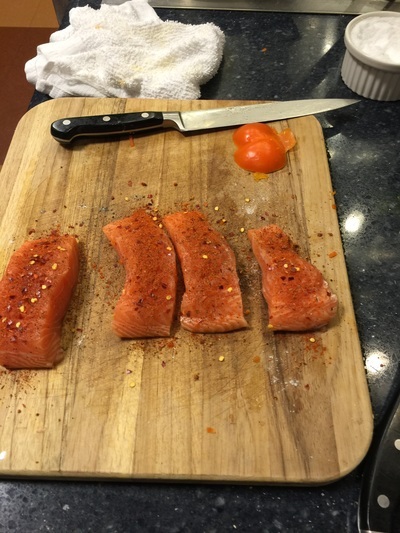 Place cloves of garlic on the EDGE of the cutting board before you attempt to smash with the knife blade. We learned the proper way to hold a large knife when chopping, as well as a spatula when turning food. Use your index finger and thumb on knife, place thumb on spatula handle and fold fingers underneath. Very effective. Never use minced garlic in a jar. EVER. Packaged peeled garlic cloves are available for purchase, and worth the effort. The handles on tongs may be used to effectively juice limes. Pam notes: "Unlike Gerry, I was unable to master it even though it looked quite easy." 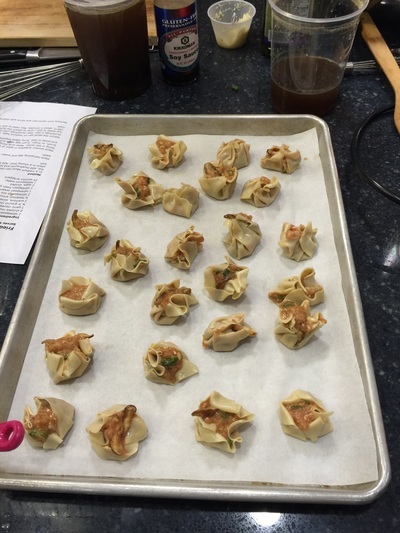 Forming wonton wrappers stuffed with a chicken mixture into little purses is way too hard, and we were terrible at it. Mike and Sharon had it down! Watching Chef Jeremiah utilize a pressure cooker for a variety of tasks made me realize they have come a long way since my mother used hers for canning stuff. We may look into getting one. Jury is still out. When all the cooking had been completed, the four students were invited to sit at a table that been prepared in advance with a white table cloth, white napkins, white dishes and wine glasses. Both chefs plate the food and place it and freshly uncorked and decanted wine on the counter. We served ourselves the dishes we had watched and helped prepare. During this time the chefs finish the clean-up and leave the students to dine. 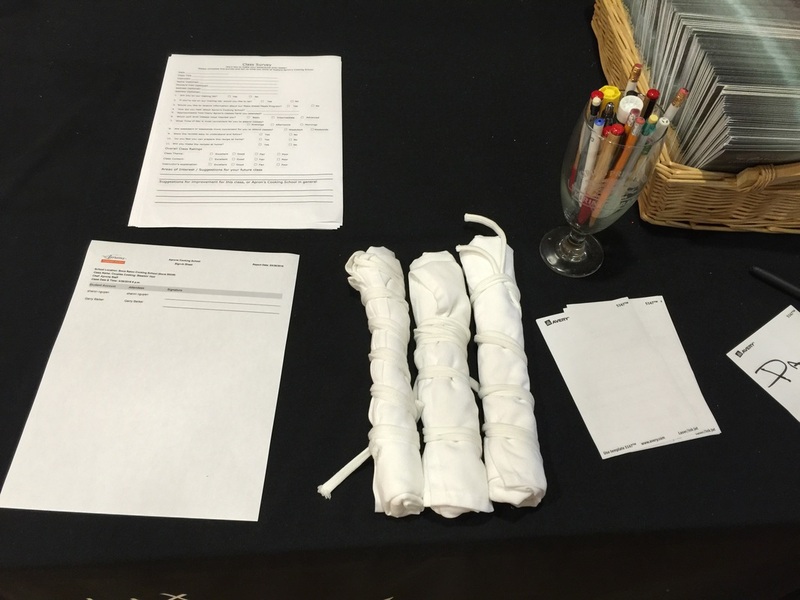 All the recipes prepared in the class are typed up, stapled and ready to take home. Aprons Cooking School was fun, and both chefs gave us recipes we will use in the future. Our only recommendation/very minor complaint? 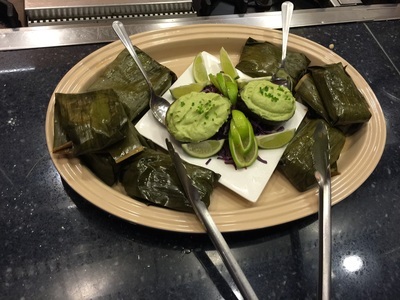 A side-dish would have been a nice addition, as well as a dessert. 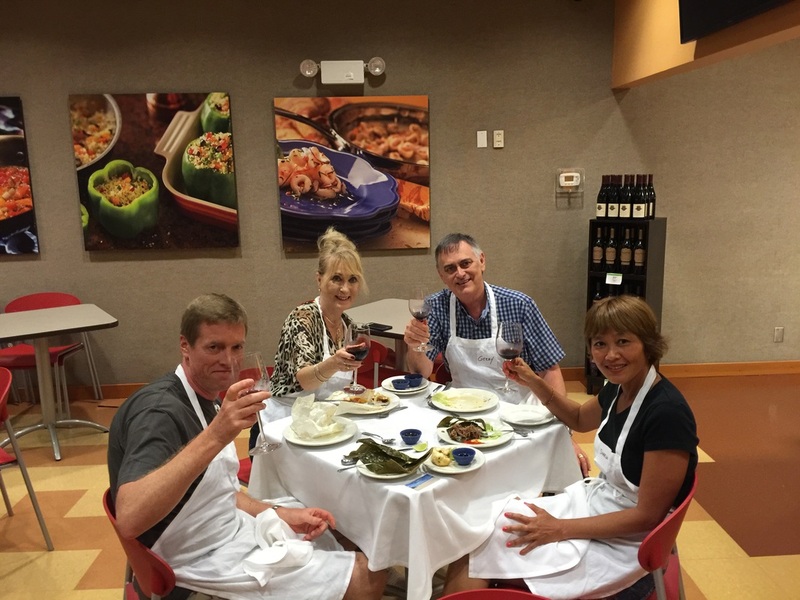 So, we give our cooking school experience five spoons out of five! 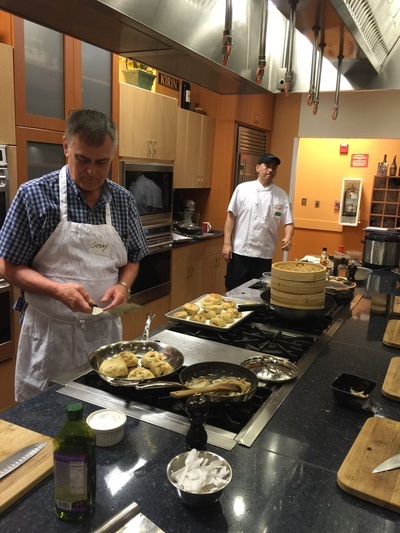 Chef Michael Walters -- Michael is a graduate of Johnson & Wales in Rhode Island. However, that was not where his love for cooking started. Michael's family was rich in the culinary field but in many different ways. Michael's Grandmother was a dietician and his parents were in the wholesale food business. Michael was always in the kitchen with his Mother. Michael is originally from Brooklyn, New York and started out working in catering halls and learned from many great Chefs. After moving to Florida he was looking for a new direction in his culinary career and tried his hand at restaurant management or being in the "front of the house". He knew that his love was cooking, but what he really enjoyed most was being with the customers. Michael helped to open Maggiano's Little Italy in Boca Raton and then went on to managing at Mario's of Boca. Michael then left for an opportunity to work at the prestigious Woodfield Country Club in Boca Raton as Food & Beverage Manager. Michael has returned to his culinary roots and is pleased to be a part of Publix Aprons Cooking School. He is excited to share his love and knowledge of food and culinary experiences with others. Chef Jeremiah Liburdi -- Jeremiah fell into cooking in the 90's and never looked back. 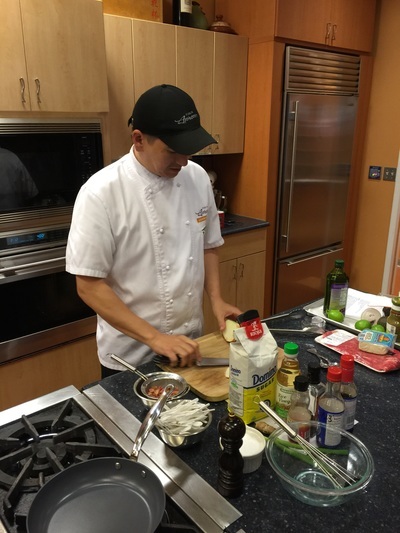 He attended Florida Culinary Institute in 2001 and then cooked for a short stint in Hawaii before moving back to the Tampa/Clearwater area and cooking at various restaurants and country clubs. Finally moving home to Boca Raton in 2005, he spent the next several years cooking in various upscale and fine dining restaurants. 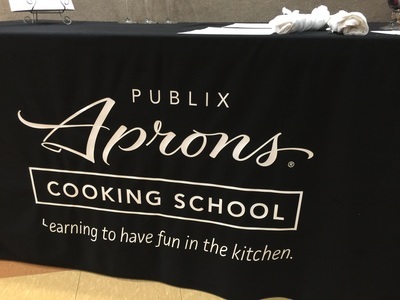 Jeremiah came to work at Publix in 2013 to hone his butchery skills by working in the meat department before an opportunity to teach at the Aprons cooking school presented itself. Feeling that teaching was the next logical step in the progression of his culinary career, he jumped at the opportunity. Jeremiah's background is nearly as eclectic as his cuisine, born in South Korea to an American Army father of Irish Italian decent and a Korean mother, then having grown up the nomadic lifestyle of an "army brat" with stints all over the central US and some time in Europe.